Showing 13 articles from November 12, 2013. A military transport vehicle represented the Lewis County Veterans Memorial Museum during the Lewis County Veterans Day Parade in Toledo Saturday. The second year held in Toledo, the parade was originally established in 2009 by local community member April Pennington as a way to honor area members of the military, both past and present. Pennington Farey has since been joined by a number of volunteers and Veterans’ groups, and the parade has not incorporated the Veterans Wall of Honor recently established at Kemp Olson Memorial Park, in Toledo. 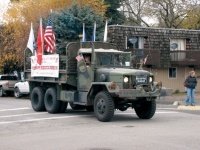 Those interested in helping to plan and/or participate in future parades can visit www.lewiscountyveteransparade.com. Don’t let the name fool you. You don’t have to be a Lioness or a Lion to join the Lions Club Egg Days Committee. There are no membership dues, no age limits, and you are not required to attend every meeting. All you have to do is want to become involved by putting some time and effort into an event that has been around since 1937. Sacred Heart Parish, in Winlock, and St. Francis Mission, in Toledo, will once again offer their annual Free Thanksgiving Dinner, open to anyone who would not otherwise have a special day on Nov. 28. Dinner will be served at 1 p.m. at St. Francis Mission (139 Spencer Rd., Toledo). 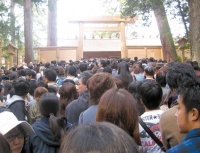 Every 20 years, the shrines of Ise Jingu, in Mie Prefecture, Japan, are entirely rebuilt. Not because there was anything wrong with the old ones, but so the techniques and craftsmanship required to build such shrines are not lost to the younger generations. This is a busy week at Pioneer Hall for some of the ladies in Town. The Women’s Club Luncheon and Meeting is on Wednesday the 13th at noon. It will be a “White Elephant” Auction and a good place to part with some no-longer needed items. The next day the Red Hat Ladies will gather at 2 p.m. Both events will, no doubt, include making Holiday plans that include the Holiday Cheer Bag project in December. The Social Club’s monthly Town Potluck with Meeting will start at 5 p.m. on Saturday at the Café. With all the great cooks in this Town, you won’t get a better meal anywhere. Some stay after and play cards and games. All are welcome. My 20-something nephew related a Strauss-Howe type 4-generational cycle as periods of poverty, war, and prosperity, followed by his, a lost generation. Agree or disagree? Friends of the Toledo Library deserve a toast for their tireless efforts. Annexation to Timberland Regional Library System passed with 2/3 votes. Now, for a brick-and-mortar library. Join the Club! Contact Bill or Pat, CALDWELL@toledotel.com or (360) 864-6757. The Olequa Senior Center will be hosting a Medicare “Open Enrollment” presentation on Wednesday, November 20th, during their noon lunch. For more information, please contact the center at (360) 785-4325. Evaline Elementary’s Booster Club is meeting on Tuesday at 6:30 p.m. in their cafeteria. A board meeting is scheduled to follow at 7 p.m.
Toledo is set to begin a $9.6 million dollar construction project next year to replace the town’s aging sewer system. The sewer replacement project has been in the planning stages since October 2011 and is nearly ready to open to bidding. The project is scheduled to be completed and online by 2015. After much discussion and debate, the Vader City Council has postponed voting on allowing or prohibiting a state-licensed recreational marijuana production facility to be built in city limits. Councilman Kevin Flynn proposed implementing a six-month moratorium on marijuana production during the council’s Nov. 5 meeting. The Castle Rock girls soccerteam had their season come to an end Nov. 5 in the first round of the District IV playoffs with a 4-1 loss to Elma at Stewart Field in Aberdeen. The loss has been tempered as Elma went on to beat the formally undefeated and Trico League champion Woodland Beavers on Thursday night and then avenged their only two losses of the season by taking down Rochester. To advance to the state tournament. Speedster Mikayla Risner scored the only Rocket goal in the final three minutes as she fooled a defender and embarrassed the goalie with her walk-in goal. The Toledo/Winlock boys and Sally Martin participated in the biggest and final race of the cross country season during the WIAA State Cross Country Championships held in Pasco on Saturday. As an individual, Martin placed 88th in a race of the 138 1A best runners in the state. A mechanical failure has been credited for a collision near Winlock Nov. 6, according to the Lewis County Sheriff’s Office. The 20-year-old male driver of a 1991 Nissan 3ZX had been traveling on the 100 block of Meier Rd., north of Winlock, when he began making a right turn onto Highway 12. The vehicle began stalling and, after the driver applied the gas pedal, began to fishtail and ran off the road. Fall is officially upon us, and winter is just a chill away. Though summer is long gone, for many the season is guilty of leaving behind the leathery and sagging skin, brown spots and wrinkles that can result from the sun's ultraviolet rays. More than 90 percent of the visible changes commonly attributed to skin aging are caused by the sun. Though sun damage is cumulative, there are ways to repair, and even reverse damage done during the summer months.